we are all bounded by numbers, damned by probabilities. Note: I use "open source" here, but I really mean "the amalgamation of open source and free software as defined by the Open Source Definition and the Free Software Foundation, respectively". It was the shortest thing to type. I have been thinking a lot about open source from a business perspective lately. While the statement that “open source is not a business model” is true, to frame my thoughts I started with categorizing the existing business models for open source software companies. These companies build open source solutions for their customers on contract, often around existing open source technologies. Examples of this model are Igalia, Collabora, Open Source Consulting Group, but other companies often have open source consulting offerings in addition to their primary business model. I have been going to FOSDEM on and off for the last nine years or so, and I have somewhat notoriously described it as 10 pounds of conference in a 5 pound sack. It is the sort of conference where European FOSS contributors and users can be assumed to be present (and lots of other international ones as well). I like FOSDEM, I like that it is community run, I like the wide range of topics it covers, and I even like Brussels (I mean, beer, cheese, and chocolate, how can you go wrong). I do wish they would find a larger venue (my 6'4" body does not fit into most of the seats that the devrooms use), or a longer duration (there are too many devrooms going at once, and too many people who wish to be in those devrooms), but I don't expect these things to change. This year, I spoke at the CentOS Dojo before FOSDEM, the first time I have done so. I spoke on the topic of using the Developer Toolset to build modern code on CentOS/RHEL, specifically in my case, Chromium. There wasn't a lot to say on it, to be honest, since it can be summarized as "Chromium uses C++14 features not in the CentOS gcc, using Developer Toolset makes it build", but I tried to make it interesting with pictures and details. I attended Midwest Rep Rap Fest 2015 this weekend, in Goshen, Indiana. Goshen is about 45 minutes outside of South Bend (the nearest regional airport). This part of Indiana is noteworthy for a few reasons, including the fact that Matthew Miller, the Fedora Project Leader, is from there. It also has a very large Amish population, which makes it one of the few places I've attended a conference where most of the local businesses have a place to tie up your horses. The Midwest Rep Rap Fest is an event dedicated to Open Source 3d printers (and their surrounding ecosystem). The primary sponsor of the event is SeeMeCNC, a local vendor that makes open source hardware delta 3d printers. A Delta printer is a 3d printer with a circular stationary bed. Attached to the bed are three vertical rods which serve as tracks for three geared motors. The motors move up and down the rods, and are connected to a central extruder which hangs down the center. The extruder is moved in three dimensions by moving the supports along their tracks. Watching a Delta 3d printer do its thing is pretty amazing, it seems to dance like a trapeze artists as it dips and swoops to print the object. The Delta type of 3d printer was the most common printer at the event, many people had either bought SeeMeCNC printers or had built their own off their open source design. The SeeMeCNC team brought their super-sized Delta, which they think is the largest Delta printer in the world. It was easily 30 feet tall and barely fit in the building we were using (which is saying something, because we were in an exhibition hall at the local state fairgrounds). The owner of the company decided to see how big of a Delta printer he could build, and this was the result! The printer used a shop vac to blow plastic pellets up a plastic hose into the giant heated end. Originally, they were trying to print a giant model of Groot (shown in progress in my picture above), but they had to leave it running overnight on Friday and when we came back Saturday morning, the print had failed because it had run out of plastic pellets! Later on, they printed a very large basket/vase with it (after fixing it so that it wouldn't run out of plastic). Fedora had a table in the main room. I brought two open source 3d printers from Lulzbot and controlled them both from my laptop running Fedora 21. My larger printer, the Taz 4, was configured with a dual extruder addon, and I spent four hours on Friday calibrating it to print properly. 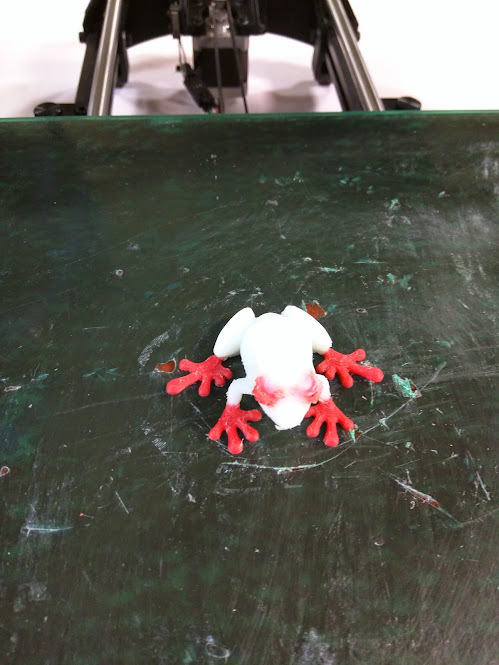 On Saturday morning, I printed my first completely successful dual color print, a red and white tree frog! The eyes didn't come out perfect, but it all came out aligned and in one piece. Several people offered me tips and advice on how to improve the print quality with the dual-extruder setup. One of the nice things about the Rep Rap fest was the extremely friendly nature of the community. Everyone was eager to help everyone else solve problems or improve their printers/prints. I used Pronterface to control the Taz 4, since it was better suited to handle the dual extruder controls. My smaller printer, the Lulzbot Mini, was controlled with Cura-Lulzbot (a package which got added to Fedora a few days before the show!). Cura has a very fast and high quality slicer, but with less options for tweaking it than slic3r (the traditional open source slicing tool) does. 3d printers depend on a slicing tool to take a 3d model and convert it into the GCode machine instructions that tell the printer where to move and when to extract plastic. Cura also has a more polished UI than Pronterface. The Lulzbot Mini is able to self level, self clean, and self calibrate, which almost eliminates the prep time before a print! One of the vendors at the show was Taulman, who is constantly innovating new filaments for 3d printing. They announced a new filament the weekend of the Rep Rap Fest, 910, and they gave me a sample to try out on the Mini. The Mini can print filaments with a melting point of 300 degrees Celsius or less, so it was well suited for the 910. 910 was interesting because it was incredibly strong, almost as good as polycarbonate! 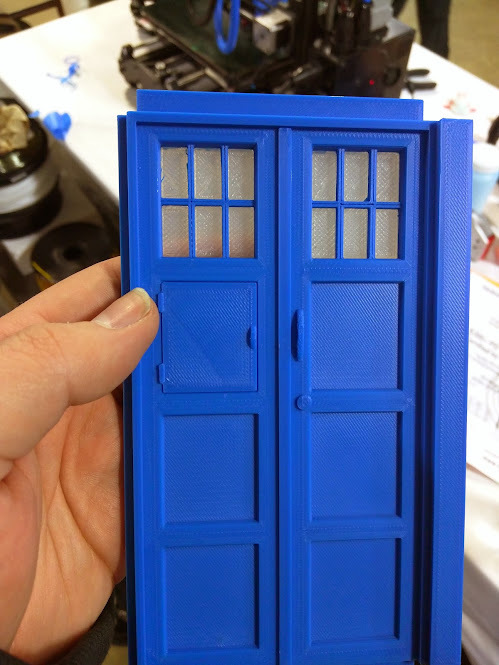 It was also translucent, which made it ideal for me to finish a project I've been working on for a long time: my 3d printed TARDIS model! I printed four window panels and a topper piece for the lantern on the roof. A few other people had TARDIS models (including one that had storage drawers inside it), but mine was the biggest (and I think, the nicest). 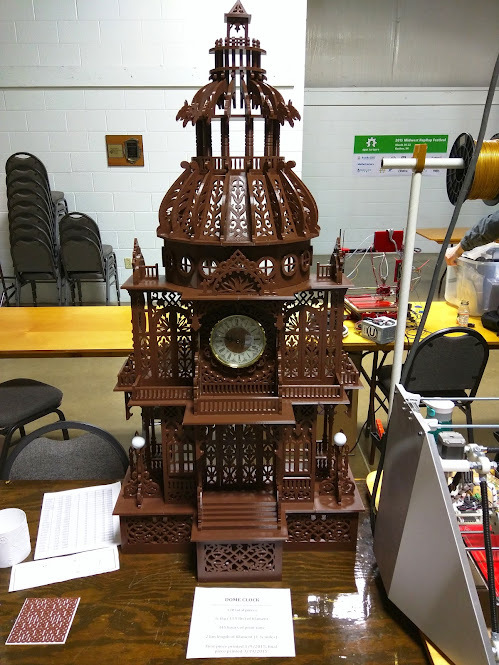 Another neighbor had 3d printed an amazingly intricate "home clock". They had used a famous woodworking pattern, converted each of the pieces to a 3d model, then printed them. Each piece was then smoothed and attached together. The only piece they didn't print was the clock at the center! On the table, the top of the clock was taller than me (and I'm 6'4"). It didn't look 3d printed, it looked too nice! It took them 3 months to print it all. The owner said that if you're able to cut this model from wood and assemble it properly, you're considered to be a master in their community. Everyone was definitely in awe of it in this community. It seemed like everyone showing off something at this event had a clever hack of their own. Some people were creating amazing models, some people had built new open source printers. One printer had color changing LED strips attached underneath it which changed from red to green to indicate the progress of the printing job. Another printer had a Raspberry Pi with camera wired into it so you had a "printer's eye view" as it printed. There was a custom 3d scanner designed to scan people's heads and torsos to make printable busts. There was even a printer that looked like some sort of industrial robot gone mad! The one thing these all had in common? They were open source. No one here was questioning open source, it was just the way they operated, sharing what they knew and building off each other's successes (and failures). There were a few MakerBot Replicators, but all of them had been hacked in some way. Attendance at this years event was both up and down. There were more people and companies exhibiting at the event, including Texas Instruments, Hackaday, Lulzbot, Taulman, and Printed Solid. Printed Solid was giving out free samples of some amazing ColorFabb filament. I came home with some BronzeFill (prints into a bronze like material that when polished is heavy and shiny), a new flexible filament, and some carbon-fiber infused filament! They also had some really fantastic glow in the dark filament, but no samples of that were available (and I didn't have the spare cash to buy a full spool). General attendance at the event was about 750 people, which was down from last year (around 1000). The general consensus was that the event wasn't doing all it could to advertise itself, and the location wasn't exactly optimal (45 minutes from the nearest regional airport, almost 2 hours from a major airport). The majority of visitors were local to the Indiana/Michigan area. The event staff said that next year they plan on rebranding the event to a more general FOSS 3d printing event (not limiting themselves to the Midwest region of the US). I think that is the right decision, since they are the only open source 3d printing event that I'm aware of, and I'd really love to see them grow into something bigger and more accessible. Oh, did I mention we had a celebrity at the event? Ben Heck was there with his Delta printer! He's built a pinball machine. I might want to be him a little bit (but I'm not). He was very friendly and cool, spent a lot of time talking to the other makers and attendees. Thanks to Ben Williams, Fedora had a very nice booth setup. We had our Fedora tablecloth and lots of stickers to give away. I brought a good sampling of models I'd printed with Fedora and my 3d printers, and I had a lot of good conversations about using Linux and open source to power 3d printing and 3d model creation. My coworker (and celebrity writer) Brian Proffitt stopped by on Saturday and helped out at the table for a while. I was supposed to have Fedora 21 media to hand out, but the promised shipment never arrived. The computers there were a mix of Windows and Linux, very few Macs in this community. Several people were using Fedora, but most of the Linux instances were Debian. The Fedora event box needs a little love, there wasn't very much in it that was useful anymore. The OLPC in it is very old now, and since the current OLPC hardware runs Android these days, it isn't as "cool" as it used to be. I restocked it with Fedora bubble stickers, but it probably needs a plan to revitalize it. A) I really believe in building things from source code. At the very least, I should be able to take the source code and know that I can follow instructions (whether in an elaborate README or in src.rpm) and get a predictable binary that matches it. This is one of the core reasons that I got involved with FOSS oh so many years ago. B) I'm a bit of a perfectionist. I wanted any Chromium builds to be as fully functional as possible, and not just put something out there with disabled features. C) Chromium's not my day job. I don't get paid to do it by Red Hat (they don't mind me doing it as long as I also do the work they _do_ pay me for). D) I also build Chromium using as many system libraries as possible, because I really get annoyed at Google's policy of bundling half the planet. I also pull out and package independently some components that are reasonably independent (webrtc, ffmpegsumo). BB) ... and the core problem was the toolchains that Chromium requires. Chromium relies upon two independent (sortof) toolchains to build its Native Client (NaCl) and Portable Native Client (PNaCl) support. NaCl is binutils/gcc/newlib (it's also glibc and other things, but Chromium doesn't need those so I don't build them), and PNaCl is binutils/llvm/clang/a whole host of other libs. NaCl was reasonably easy to figure out how to package, even if you do have to do a bootstrap pass through gcc to do it, but for a very long time, I had no success getting PNaCl to build whatsoever. I tried teasing it apart into its components, but while it depends on the NaCl toolchain to be built, it also builds and uses incompatible versions of libraries that conflict with that toolchain. Eventually, I tried just building it from the giant "here is all the PNaCl source in one git checkout" that Google loosely documents, but it never worked (and it kept trying to download pre-built NaCl binaries to build itself which I didn't want to use). After a few months not looking at Chromium or NaCl or PNaCl, I revisited it with fresh eyes and brain. Roland McGrath was very helpful in giving me advice and feedback as to where I was going wrong with my efforts, and I finally managed a building PNaCl package. It's not done the way I'd want it to be (it uses the giant git checkout of all PNaCl sources instead of breaking it out into components), but it is built entirely from source and it uses my NaCl RPMs. The next hurdle was the build system inside Chromium. The last time I'd done a build, I used gyp to generate Makefiles, because, for all of make's eccentricities, it is the devil we understand. I bet you can guess the next part... Makefile generation no longer works. Someone reported a bug on it, and Google's response is paraphrased as "people use that? we should disable it." They've moved the build tool over to something called "ninja", which was written by Google for Chromium. It's not the worst tool ever, but it's new, and learning new things takes time. Make packages, test packages, build, repeat. Namespace off the v8 that chromium needs into a chromium-v8 package that doesn't conflict with the v8 in Fedora proper that node.js uses. Discover that Google has made changes to namespace zlib (to be fair, its the same hack Firefox uses), so we have to use their bundled copy. Discover that Google has added code assuming that icu is bundled and no longer works with the system copy. Discover that Google's fork of libprotobuf is not compatible with the system copy, but the API looks identical, so it builds against the system copy but does not work properly (and coredumps when you try to setup sync). Add all the missing files that need to go into the package (there is no "make install" equivalent). Then, we test. Discover that NaCl/PNaCl sortof works, but nothing graphical does. Figure out that we need to enable the "Override software rendering list" in chrome://flags because intel graphics are blacklisted on Linux (it works fine once I do that, at least on my Thinkpad T440s, your mileage may vary). Test WebRTC (seems to work). Push packages and hope for the best. Wait for the inevitable bugs to roll in. I didn't do an i686 build (but some of the libraries that are likely to be multilib on an x86_64 system are present in i686 builds as well), because I'm reasonably sure there are not very many chromium users for that arch. If I'm wrong, let me know. I also haven't built for any older targets. FOSDEM is pretty much _the_ European community FOSS event. I've been going on and off for a few years now, but in the last few years, it has had a dedicated Legal devroom, and I really enjoy that aspect of it. I spoke in a short session in the Legal devroom on H264 and Cisco's donation of openh264. I thought that talk went okay, but every time I give a new presentation, I immediately realize 10-20 ways I could have improved it (even if I never give that talk again). Afterwards, someone from Mozilla came over to argue that the Cisco release of openh264 was a net win for FOSS and Linux distros, and I think we had to agree to disagree on that point. His point eventually boiled down to "we're losing users to Chrome, we desperately need openh264 to compete", which is a bit like me saying "Fedora is losing users to other distros, we desperately need non-free software to compete". Ahem. Anyways, I was also on a panel about Governance in FOSS communities, which I thought went well, even if most of us on the panel were not entirely sure whether we were qualified to speak on that topic. :) Karen Sandler had some good questions, as did the audience, and it was a packed room. Not to take away from any packed room, but FOSDEM has really really outgrown its venue. The Université libre de Bruxelles is nice, and it is free (or mostly free from what I hear), but 3 out of 4 sessions I'd have liked to see were full before I even had a chance. They need a lot bigger rooms (or more days with repeat sessions). I also brought a Lulzbot Taz 3 3d printer with me, but because I'm an idiot (and assumed an auto-switching power supply), I cooked the power supply in the first hour. Later, we thought we had a working power supply replacement, but it was a 110V (and the Taz 3 really needs a 230V supply). Thankfully, the Fedorans had brought some Rep Rap printers, so we had 3d printing the whole time, just not on the Taz 3 so much. Lesson learned. Lulzbot donated that Taz 3 (and a replacement power supply) to hackerspace.be. I had a lot of good hallway discussions with people (there were a larger than normal contingent of US Fedora people around because of devconf.cz, which was a week after FOSDEM, but I opted out this year), and a good sampling of delicious Belgian beer. After FOSDEM, I flew to Prague for two days, to scope out the venues for Flock 2 (Electric Boogaloo). My wife walked by, saw it, and asked me "what is that ugly thing on your computer?" I was forced to simply shrug in agreement. Now, I admit, I do not possess the finest of tastes. My tastes are less caviar and champagne and more bacon and beer, but that's fine for me. I know what I like, and I know that this pink spray is not it. I figured there might be others who don't appreciate the choice of artwork here either, so I took a few moments and figured out how to change it. If you go into the gnome-control-center (accessible from the top right menu, then clicking the "tools" bubble), then click on "Background", it will open a window where you can change Background and Lock Screen. Clicking on Lock Screen brings up an interface where you can choose from a set of art (either Wallpapers, Pictures, or Colors) that has been hardcoded by the GNOME upstream for your viewing pleasure. Pick one of these pictures and the Pink Panther nightmare is gone. Okay, so maybe that's only funny to me, but I kept thinking that the Pink Volcano reminded me of that. Download a copy of that file (or whatever JPG or PNG you like), and put it into ~/Pictures. Now, it will show up in the gnome-control-center tool when you restart it. Then you can select your custom lock screen. I can't help but wonder why they do not have a file selector here. Seems like the sort of thing that would be nice. Maybe it is coming soon. EDIT: Documented using ~/Pictures instead of altering the hardcoded wallpaper XML list. I've been very very busy lately writing frantically for the Raspberry Pi Hacks book (OMG deadlines everywhere), but I made a little video to go with one of the hacks, and I thought people might be interested in it. I painted a Raspberry Pi with NeverWet paint and ran it completely submerged in a container of water, with no case. Running Pidora, of course. I apologize for the video quality. Cell phone was all I had handy. At the request of Mo Duffy, I've updated my scribus 1.5 packages to the latest SVN trunk code, and built them for Fedora 18 and 19 (the currently stable releases of Fedora). I mostly do this as a convenience to Mo, but if you poke me politely, I can probably be coerced into updating them from time to time. I've been trying to shove everything that needs doing into a running todo list, but I'm sure I'm missing something. This is your chance to point out anything that you think I need to do, but haven't done (or shown any signs of doing). No need to point out Chromium, I know about that one. We didn't have a lot of time to put Flock together, and that meant that we had to make a lot of quick decisions without the ideal transparency or community involvement. Wherever possible, we tried our best to be open about the process and solicit help from others, but at the end of the day, we had basically 3 months to make the first Flock event happen. We had a guaranteed venue cancel on us after we had started planning around them and had to restart that whole planning process. Thankfully, the College of Charleston (and the fine folks at the Charleston Linux Users Group) volunteered their space, time, and networks for us. Putting Flock together was one of the most hectic and crazy things I've ever done, and it wouldn't have happened if not for the help of everyone on staff, but especially Ruth Suehle. Ruth was doing so many things behind the scenes to tie all the loose threads together. To put it bluntly, anything at Flock that you liked was probably her handiwork. Her job was mostly a thankless one, but she was always there, trying to make things more awesome up until the final hackfest ended. Of course, none of this would be possible without Red Hat. Red Hat believed in the idea of overhauling the Fedora conference and funded it at a scale never before thought plausible. They helped us navigate the financial complexities, made it possible for us to involve third party sponsors, purchased/loaned/rented equipment so that we could stream big chunks of the conference over the internet, and gave us carte blanche to put it all together as we saw fit. I go to a lot of technical conferences every year. I wanted to try to bring some of the nice things that I've seen at other conferences to the Fedora contributors, and to try to bring as many of those contributors together as I could. I'm pretty proud of what we accomplished together. I hope that everyone came away from Flock energized, excited, and ready to work on making the world a better place through Fedora. Next year, we have an ever bigger challenge for Flock: to do it again, but in Europe. We're going to have a call for bids coming up in the next few weeks, and we're going to be looking to our community to work with us to make an even better Flock for 2014. It is a lot of work, but the end result is worth it. Today, I said goodbye to Seth Vidal. Eunice, his partner, asked me to speak at his funeral, on behalf of those of us in the open source community. I've read a lot of fantastic remembrances in the last several days, and honestly, I'd tried and failed to write my own several times. The words just seemed incomplete, that they couldn't do him justice. Nevertheless, last night, I sat down and wrote something that was the best I could do. I wanted to share it with everyone else who could not be at his funeral today. Seth was a good man, and that is a rare thing in our world. He believed that our world is what we make of it, and he was determined to make it better. He was passionate in his beliefs, but never a zealot. He was brilliant, the sort of brilliance that lights up a room. When I first met him, 15 years ago at a Linux Users Group meeting, I thought to myself that this was someone I wanted to know, someone I wanted to learn from. His flame burned so brightly that you were just drawn to him, you wanted to work with him, and you couldn't turn away. I was lucky enough to have that chance, as a co-contributor to the Fedora community, and eventually, as his manager at Red Hat. I remember giving him problems to solve, difficult problems. You could see him thinking it through, dissecting them, asking questions, and working out solutions, and it was just inspiring. I've read so many stories in the last few days about how he planted seeds in other people, how he inspired others, how he made them better people. He truly cared about everyone (and everything) around him, and would selflessly give of himself, his time, his talents, and his heart. His code is used by millions of people, all over the world, but his generous spirit, his passion, and his caring, that lives on in the hearts and minds of so many. Those seeds that he planted in us all, he contributed without a second thought, representing the purest spirit of open source. To put it simply: his legacy is not only that he made the world a better place, although, he did, but truly that he inspired us all to do the same, and to do it together. I think it is telling that my favorite memories of Seth are not tied to work or code, but rather, of laughing with him, playing games with him, suggesting books to each other, even listening to him sing Beastie Boys songs in the worst New York accent ever. I remember him comforting me when I was sad, calming me when I was angry, and always, always, being honest with me. Seth was humble, I think he'd be a bit bothered that I said all that about him. Carl Sagan once said, "For small creatures such as we, the vastness is bearable only through love." Seth made our corner of the universe bearable with his love, and we all miss him terribly. The call for talks (and workshops/sprints/hackfests) for Flock 2013 is due to close on May 31, 2013. We've got some great submissions already, but we really would love some more. Flock is your chance to present your project or your ideas to the Fedora Community for consideration. Think we should do something differently? This is the forum to do that. Want to influence the future for releases like Red Hat Enterprise Linux and CentOS? It happens in Fedora first. Want to teach others how to do something in Fedora? Propose a workshop. Want to build something new for Fedora? Lead a hackfest! It is easy and cheap to complain about something, but it is more worthwhile to contribute to solving a problem or making something better. Flock is that chance, and we need you! Today was the day of "stuff I can't talk publicly about". Sorry. * Updated matreshka to 0.4.0 in rawhide, now that gcc has a fix for the ada bug that was blocking it. Tagged gcc override into F19, but the buildroot never regenerated... so I will have to keep waiting to rebuild it there. Flock Call For Papers (and Registration) is Open! For eight years, Fedora users and developers have gathered at an event named for them, the Fedora Users and Developers conference (FUDCon). But we’ve grown, and it’s time for a new approach: Flock. Flock will bring together the Global Fedora communities for three days of scheduled content with one optional day at the end for open hacking. Unlike the barcamp style we've used in the past for FUDCon, Flock will accept submissions in advance for talks, hackfests, sprints, and workshops. The schedule will be built based on the community's votes on those submissions. This is a Fedora focused event, but we welcome participation from the entire Free Software community. If you have an idea on how we can improve Fedora, we'd love to hear it! Ready to submit a talk or register? Go to http://flock-lmacken.rhcloud.com/. All submissions must be received by May 31, 2013 at 11:59 p.m. ET. * Fixed nightview in rawhide. Still not entirely sure how. * Lots of meetings. LOTS. * Created new libxdiff to try to eliminate bundling in git and libgit2. Not tested yet, ran out of time. Feels like an unproductive day. Working from home today. More flock sponsorship stuff, Google is committed at the Gold level (hooray for Ruth!). * Looked into nightview again, ghostscript is still broken. * Fixed bug where a few R packages were still using ancient and unnecessary scriptlets. * The 3d printer is no longer printing properly. I thought it might be an incorrect Z-stop height setting, but if so, I can't seem to get it right. Also, the filament keeps getting jammed and the gears just chew it up and it stops printing. :/ Spent an hour or two trying to get it working again, then gave up. * Fixed mygui in Fedora 19/rawhide. Remembered why I dislike CMake. * Tried to fix matreshka, got it to build cleanly, but it fails %check... :/ Committed my changes to rawhide, hopefully it will inspire someone else to finish. * Got the 3d printer working again! Hooray! It is so touchy. * Built julius packages for f17-f20. That was only outstanding since October 2012. Whoops. * Looked at LLVM when fixing dragonegg, my eyes hurt now. * Last night, I went over to visit Ray Strode (and Mo Duffy) with my Lulzbot AO-101 3D printer. I'd managed to break one of the wires on it, and Ray helped me fix it. It still isn't printing properly, but it's not broken as far as we can tell. It isn't extruding plastic reliably, and I strongly suspect the replacement part that we had to install (that part holds the plastic filament against a gear, and the gear turns to "extrude" the plastic filament into the hot end. Going to try a few more things, but then I'm going to reach out to the manufacturer again. This is my first 3d printer, and while it is very cool, it sure is finicky. * Asked Kevin Fenzi to create "flockpress@" and "flockinfo@" email aliases. * stayed awake through the entire Staff Meeting! Lately, I've felt a lot of frustration and unhappiness, and that has affected me in a lot of different ways. I'm trying to take steps to turn that around, and one of them is to try to write more about what I'm working on or thinking about. Now that the Alpha is done, I'm in the process of updating my laptop to Fedora 19. Wish me luck! I've been working closely with Ruth and Robyn to try to put together a new conference for Fedora Contributors, called Flock. We were waiting on the Red Hat budget to finalize before we started, then when that happened, we found out that there was a good chance that we'd have a very nice conference venue donated to us, so we started doing some very initial planning around that. Unfortunately, that venue wasn't applicable over a weekend, so we couldn't use it. We evaluated several sites as possibilities, one of which was Charleston, SC, which was especially compelling because they were also willing to let us use them as a venue space at no cost. I spent a lot of time looking at how other Linux distributions run their events (Debian, OpenSUSE, Ubuntu), and trying to base Flock in that model. We had a pretty productive IRC meeting yesterday to discuss Flock, and we setup two mailing lists (flockinfo, for low-traffic announcements about flock, and flock-planning, a high-traffic mailing list for planning the event). I talked a bit about the format of the conference, where things are mostly scheduled in advance. Luke Macken has been making an improved registration app that can also handle submissions for talks (or other scheduled things like sprints), based on the work that Ian Weller did for FUDCon Lawrence. I also talked about how we wanted all the talks to be live-streamed, with volunteers coordinating questions from IRC and running a clock. * tatica suggested that we have a scheduled split between talks (45min-1hr) and workshops/sprints/mini-hackfests (2 hrs). I liked that idea, and proposed that we use the morning for talks, then lunch, then after lunch, scheduled workshops/sprints/mini-hackfests. We already wanted to block off two days at the end for unscheduled hacking, this is in addition to that. * j_dulaney pointed out that we need good quality audio for streaming talks, something that didn't happen very often in Lawrence. August 7 - 13, 2013 for the dates (August 12 and 13 would be optional "hackfest days" with no assigned schedule in advance). I packaged up LibreCAD and libdxfrw (dependency) for review in Fedora. libdxfrw got reviewed this morning, and it has some items I need to fix up. Over the last several days, I've been working on updating R to 3.0.0 in Fedora. Normally, my position on updating R is that I push updates for new stable releases to all stable branches of Fedora (and EPEL 5 & 6), but with 3.0.0, because of core changes, it requires that all R modules be rebuilt against R 3.0.0. Initially I was going to just do this for rawhide, but then I thought it might be good to do it for Fedora 19 before it releases. I did EL6 too (there are not very many R modules packaged for EPEL, so it wasn't too hard). In parallel, there is also a bug in the "kmeans" function in R that wasn't fixed until 3.0.0. As a result, I'm going to push R 3.0.0 to Fedora 18 too, which will also require all R modules in Fedora to be rebuilt. This is trickier than it sounds, since most of these modules are dependent upon each other. In doing the initial round of rebuilds, Pierre and I only found one dependency loop (R-GenomicRanges and R-IRanges), which I fixed with a conditional bootstrapping. R is very good about not having these sorts of circular build dependencies, but when you run the R check routines, they often check for things that are not otherwise dependent for the R module to build. This just means we need to conditionalize some BuildRequires as being only needed for the %check section. I also want to rebuild things for EL5, but I can't get R to build in the EPEL-5 buildroot, seems like something might be broken with the EL-5 builders, I need to check into that. I'm helping Rahul update some of the core E components to their current releases in Fedora 19 and Rawhide. I sponsored a new packager into Fedora this week, Lokesh Mandevar. He packaged up spectrwm for Fedora. * Relicensing to a standard license to make OpenCASCADE GPL-compatible (LGPL is the obvious one, but there are plenty of others). I got a good response from them, they're going to look into it. I hope this results in a positive outcome, because that codebase is pretty interesting and useful for CAD and 3d printing tools. I contacted the Alien Arena upstream and asked them if they would be willing to drop the commercial distribution restriction on their content, and they were willing. They couldn't drop the requirement that the alienarena content not be distributed independently, but it isn't separated in Fedora, and that requirement shouldn't be a problem for us. (The reason they can't drop that requirement is because they purchased licenses for some of their content.) It hasn't happened yet, as far as I can see, but it is a good sign of intent. Fedora Summer of Open Hardware and Fun! Today (at 12:00 PM Eastern Daylight Time), we're launching a sweepstakes for our Fedora Contributors called the Fedora Summer of Open Hardware and Fun! We wanted to do something nice to thank our Fedora community for all that they do for Free Software and Content, and we thought that giving away a lot of Open Hardware would be a great way to do that. Unfortunately, we don't have enough hardware to give something to every Fedora Contributor, so this is a sweepstakes, and sweepstakes come with all sorts of rules and restrictions. This sweepstakes is for Fedora Contributors (defined as users in the Fedora Account System who have signed the FPCA and are in one additional group). There are some geographic and age restrictions, the reason for this is that it is extremely costly and time-consuming to determine whether or not it is possible to run a sweepstakes in a given country. Sweepstakes laws and regulations vary considerably from country to country, and many countries have strict registration requirements and fees associated with running sweepstakes. Other countries simply prohibit sweepstakes entirely. As a result, we are only offering this sweepstakes in countries where we know that the sweepstakes is lawful. We sincerely apologize for any inconvenience this may cause you. Also, please note that Red Hat employees are not allowed to enter the sweepstakes. Q. Hey, it's not summer where I am! Q. Why does it say Summer when it isn't Summer where I am? A. Just close your eyes and pretend it is Summer. Think of the warm fuzzy feeling you'll get from winning one of these sweet prizes. Q. Where did the money come from for this? A. I'm going to assume you mean that in a specific way, not in the "Daddy, where does money come from way". If you are really asking the more generic question, just watch this video (http://video.nationalgeographic.com/video/kids/cartoons-tv-movies-kids/cha-ching-kids/cha-ching-01-earn-spend-save-donate-kids/). For everyone else, the money for this sweepstakes came from a special allocation from the Open Source and Standards group at Red Hat, and did not take away from the normal Fedora community budget in any way. Q. Why can't Red Hat employees enter? We contribute a lot to Fedora! A. Because in the eyes of the law, it seems shady when a company runs a sweepstakes and their employees end up winning. Q. Why is there an age restriction on this? A. Because it is a sweepstakes, and that's the law. It varies by region, but our app is clever enough to adjust it accordingly. Q. I am sad that my state/country/unicorporated region prevents me from entering this sweepstakes. Is there anything you can do for me? A. We feel sad that we have to exclude you. Much sadder than the time that Tasha Yar got eaten by that sentient oil spill. Short of sending you hardware, money, or other legal impossibilities, feel free to leave a comment on this post with a suggestion on how we can make it up to you. Also, feel free to mention your country. If there are hundreds of people left out in the cold in Luxembourg, we might be able to do a legal review and have it added for future sweepstakes eligibility (no promises though). Q. What about Fedora users? Q. If I win, how will I get my hardware? A. We'll ship it to you, on our dime. We'll ask the winners for that information later. Q. I can't decide which hardware I want, can I pick them all? A. No. You need to pick one. Just one. Q. Can I enter multiple times? Q. How do you choose the winners? A. Completely at random from all valid entries. Q. How did you get so many OLPC XO units? A. The wonderful folks at laptop.org donated them for us to give away. Q. How did you get so many Raspberry Pi units? A. Black magic. Deep black magic. Q. Why Arduino? It doesn't run Fedora Linux! A. So what? It's open, its fun, and you can do all sorts of Open Source geekery with it. Q. Why didn't you choose to give away instead? A. Our crack team of Fedora experts (okay, me, Robyn, and Ruth) generated a list of hardware, then ranked them by coolness, cost, and availability. Except for the awesome and well dressed folks at Laptop.org, no one had any cool free hardware lying around (although, I offered to put some old SPARC systems in the mix, which was vetoed), so we ended up spending our money on the coolest things we could get the most of at the least cost. We'd love to do this again, so feel free to leave a comment here with your suggestions. Q. Hey, I'm a hardware vendor and I want to work with you to give away more awesome Open Hardware to Fedora people in the future, who do I contact to help out? Q. Anyone else you'd like to thank? A. Why, how nice of you to ask. I'd also like to thank Ruth Suehle & Robyn Bergeron for brainstorming, researching, and generally being awesome to make this a reality. Luke Macken for writing the app code (and making changes at the last possible minute). Mo Duffy for making it simple, clean and beautiful to enter. The wonderful folks at Farnell, Adafruit, Sparkfun, and Laptop.org for all of my export and ordering related questions. Pam Chestek and Erin Dutton, for helping this sweepstakes be fully blessed and legally awesome. Amy Ross, for addressing our many export needs. Kevin Fenzi and the folks on the Fedora Admin team for making sure we had this webapp running, and sitting in the proper location (except for that brief minute where all mainpage traffic was pointing at the webapp, whoopsy!). And of course, Red Hat and OSAS for paying for it all.